Home > Shredders > Choosing a Shredder? When in doubt on which business paper and document shredder will best suit your needs, please contact OREweb.ca® so we can help you select or choose the best model for your needs! Selecting a shredder which is too small is the most common mistake. The shredder you choose must handle various types and volumes of paper and documents for your office. If a shredder is not easy to use, is not reliable, or can not handle the capacity or volume of shredding your office does, it will not meet your shredding, security level and disposal needs. The chart on the below will help provide a general guideline for determining most office shredder needs. Another common mistake is to buy an "off-the-shelf" shredder. Many off-the-shelf shredders can last as little as three months under business level or volume shredding. Some use thin cutting blades instead of a hardened steel cylinder shredding system - and wear out quickly under work-load. OREweb.ca® brands of shredders are commercial business level shredders which can last as long as 20 years because of their design, materials, and quality. By buying the proper shredder from the start, your shred costs can end up only costing pennies a year. Before choosing a shredder, you first need to know the answer to a few questions: Who will use the shredder? A single person, a small office group, or an entire department? What are the paper sizes and types being shredded (8 1/2" x 11" - 16# or 20# paper, complete file folders, reports, etc). How much paper in a day will be shredded? Will the shredder meet growth needs in the department? When you're unsure of all the answers, it is best to buy a shredder with a larger capacity. We do recommend contacting one of our shredder sales specialist to help you determine your needs. What Volume of sheets are you destroying each day? When considering a shredder, many users look at horsepower to compare shredders - but that specification is not as important. Shredders have been tested and measured using different material - such as light weight paper. It is best to consider waste capacity, paper weight / size and how many paper sets you will normally be shredding in your office day to day. How many people will be using your shredder? And, what type of security level you will need? 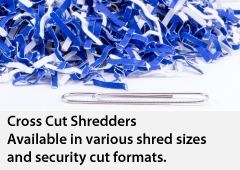 Shredders often come in several different security levels. 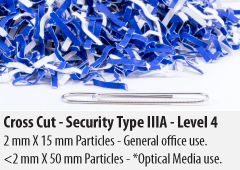 What determines the security level is the size of the shredded material waste. 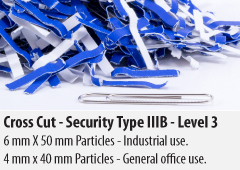 For most general office shredding - a strip cut level 1 or 3 shredder will suite your needs. This type of shredder cuts the paper into different size strips. 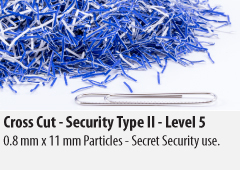 For higher security and shredding of confidential information - a cross cut shredder will provide a higher level of security from 3 to 6. A cross cut shredder cuts the waste into small confetti like particles. Cross Cut format is generally used in Government offices, Accounting Offices, and anywhere else a high level of document sensitivity exists. *See the SEG for complete table supporting notes. Strip cut shredders are not tested or listed in the SEG. Commercial strip cut shredders are permitted for Protected A and Protected B information (unless a TRA recommends the selection of an approved shredder). Security Level 1: For shredding general internal documents (uncommon shred format these days). 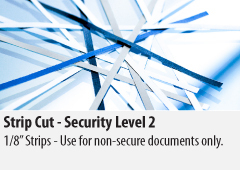 Security Level 2: Strip cut particles-For shredding sensitive internal documents. 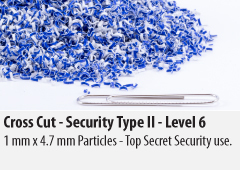 Security Level 3: Cross cut particles. For shredding confidential documents. 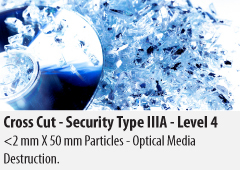 Security Level 4: Extremely fine cross cut particles. For shredding highly sensitive documents. Security Level 5: Espionage safe for extremely high demands of security. Security Level 6: NSA/CSS 02-01 specification set by DOD (US) for the secure destruction of CI through Top Secret COMSEC documents. NSA/CSS 02-02: Highest security level for high security dis-integrators.